“Facilitate and Empower the Creative and Productive processes of our clients” Our mission is to become an integral part of your competitive strategy — from manufacturing to recruiting, to executive leadership and recruitment. — We believe in working together, holistically, to provide top-notch, customized solutions for you. Together, with a transparent, productive, and simple approach, we can achieve excellence. Reverence — Reverence – is recognizing the divine essence of all creation. All, by simply existing, is worthy of respect, appreciation, recognition and reverence. Everything is an extension of the source from which everything emanates. Creativity — Creativity – Creativity is what we are! We are creative as an extension of the creator. The Creator created creative creation! If you stop hesitating, you will stop worrying about the opinion of others, you will expand beyond the limits of your mind and that of those around you, you are naturally creative! Service — Service is love in action. The manifestation of love in the service, is rising above personal selfishness and address the needs of another being. The service is possible when we leave aside our whim and gladly serve our brother, client, child, partner and neighbor. Happiness — Joy is the natural state that is experienced when we have transcended egoism and vanity. We are happy when we are free of judgment, discrimination, fear, attachment, desire and anger. We are happy when we release all attachment to the past, forgive and accept creation as it is, perfect! Synergy — Synergy is the transcendence of dualistic perception. In duality we separate parts acting separately, competing for limited resources in a context of limited time and space. In synergy, we see a united field, sharing a perpetual uniqueness that shares unlimited resources, unlimited in time and space and to recognize the reality of oneness, and every part of the total in benefited! Love — Love is the energy and vital essence we are, that encourages, moves and allows everything to be as It is! all love comes from God and is an integral part of all creation! You, are our first priority, alongside our employees and collaborators, shareholders, suppliers and the community. 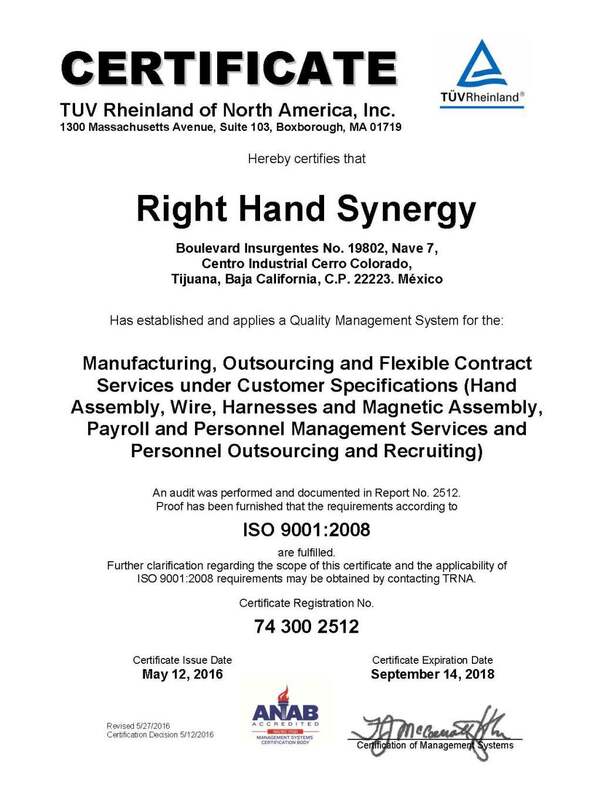 Right Hand Manufacturing is ISO 9001:2008 certificated from the International Organization for Standardization.